If you love the idea of catching a gold rally but can't stomach taking the risk of a downturn, you need to look at Royal Gold. Some of Royal Gold's mine investments. Image source: Royal Gold. Gold is one of those assets that have a special place in the finance market. Although it has industrial uses, its primary purpose is as a store of value. The price of gold can be pretty volatile, which can make investing in gold and gold stocks a stomach turning effort. But if the gold rally so far this year has caught your eye and piqued your interest as a place to invest. Instead of heading straight for the commodity itself, you should check out Royal Gold, Inc. (NASDAQ:RGLD), a different kind of precious metals company. Between mid-January and the end of April, Barrick Gold (NYSE:GOLD), one of the world's largest gold miners, saw its stock price increase 145%. That huge advance, of course, was backed by a rally in the price of gold and other precious metals. In fact, there were other miners that saw larger stock moves. It's easy to get sucked in when you see that kind of price move, but there's another side to the puzzle. Barrick lost 13% of its value in May before heading higher again in early June. And despite the huge price gains so far this year, the stock is still off around 60% from 2011, when the commodity markets started to hit the skids. A big piece of the problem is the typical boom bust cycle in the mining industry. As gold prices headed higher, Barrick, like many other miners, started to spend money on new projects, acquisitions, and expansions. When the price of precious metals started to fall, all that spending suddenly looked like a bad idea. For example, in the company's 2011 annual report it trumpeted a goal of producing nine million ounces of gold by 2016--fast forward to the first quarter of 2016 and the high end of its annual goal is now just 5.5 million ounces for the year. Along the way, the company had to write off a lot of money spent on growth plans that didn't pan out, including $3.1 billion worth of impairment charges last year alone. 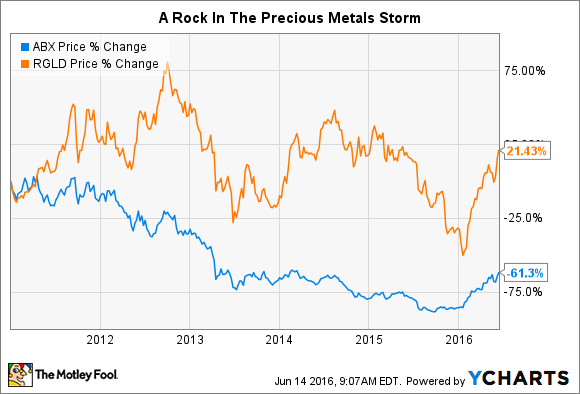 Basically, there's a lot of risk involved in investing in precious metals and the miners that produce them, particularly when the market may look most attractive. Which is why Royal Gold might be a better option. The most important thing to know about Royal Gold is that it is not a miner. Royal Gold is a royalty and streaming company, which is more like a specialty finance business. Royal Gold pays miners up front for the right to buy gold and silver at a reduced price in the future. Miners like this approach because it allows them to access capital without selling stock, issuing bonds, or dealing with a bank, which can be difficult and expensive. Royal Gold likes this approach because it gains access to cheap gold and silver, which keeps its costs down. For example, Royal Gold inked a streaming deal with Barrick in late 2015 that calls for Royal Gold to pay Barrick 30% of the spot price for a portion of the gold and silver produced from the Pueblo Viejo mine until certain production thresholds are met. After that point, Royal Gold pays 60% of the spot price. Either way, however, for an up front investment of around $600 million, Royal Gold gets locked in low prices for precious metals for the life of this mine, which is expected to be around 18 years. On average over the life of the deal Royal Gold expects to get 34,000 ounces of gold and 1.5 million ounces of silver a year. Why would a miner want to do this? The most obvious reason today is that miners are facing a difficult market and can't easily find other ways to finance their businesses. In fact, Royal Gold had a busy 2015, inking four streaming deals, allowing the company to increase its gold and silver reserve figure by 20% last year. But a tough commodity market is just one piece of the puzzle, because even in good times cutting a deal with a streaming company like Royal Gold could be a good call. That's because such agreements can be a cheaper financing option than taking a loan from a bank, issuing debt, or selling shares. The first two options increase leverage and increase interest costs, and the last dilutes shareholders. Thus, all three can be less than desirable options at times. Why does this matter? Some investors might love the idea of participating in a gold rally but might not be ready for the downside risks that come with a precious metals investment. That's where some other interesting facts about Royal Gold come into play. First, for the income investor, Royal Gold has increased its dividend each year for the past 15 years, while Barrick had to cut its dividend when times got tough. Although the 1.4% or so yield isn't much to write home about, the fact that Royal Gold has been able to support a steadily increasing distribution speaks volumes about its business and provides investors something to hold onto when times get tough. A steadily rising dividend to help you sleep at night. Image source: Royal Gold. The second big reason to consider Royal Gold over a direct investment in gold or a gold miner is stock performance. I noted above that Barrick's shares -- even after a huge rally this year -- are still well off their 2011 peak. Royal Gold's shares are up 20% or so since that same point. That's not to suggest that Royal Gold stock didn't feel the pain of the precious metals downturn. It did, just look at the price chart above. The shares were down around 33% between 2011 and the end of 2015. Barrick Gold, however, was down around 86% over that same time period. Losing less on the downside is what's allowed Royal Gold to be a performance leader over the full span, even though it's "only" up 80% or so this year compared to Barrick's 175% advance. In other words, if you can't handle roller coaster rides, buying a precious metals miner or directly investing in gold and silver might not be the best game plan. You might find that Royal Gold's unique business model suits your needs much better and without so many extreme ups and downs.